Spice once again reminded fans exactly why she has been dubbed the “Queen of the Stage,” as she delivered yet another sizzling Reggae Sumfest performance on Friday. Over the years the female Dancehall superstar has remained as one of the most anticipated acts for the annual music festival, due to her creative dance sets and often outlandish attire. 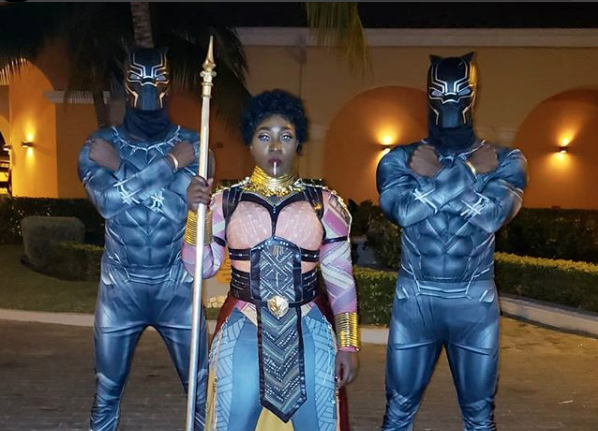 Last Friday was no different as the “Needle Eye” deejay thrilled fans with her “Wakanda” themed performance on Night One of the Reggae festival. Spice hit the stage donning a African inspired regalia, which looked like it was ripped right from the pages of the Black Panther comics. The entertainer’s royalty theme completed with a throne, which was carried by two males decked in full black. “Yuh si Black Panther inna movie and tonight you going to see him inna dancehall,” said the deejay. Fans seemed to be loving every minute of the entertainer’s performance as they gave her a roar of approval for her thought-provoking dance moves, which included a dance-off with a dwarf. The performance was however marred by one small incident, as the deejay blasted stage security for trying to block a man she challenged to dance with from entering the stage. “A wah do dah security bwoy yah,” the deejay asked before venting to stage management.